Ideal for couples, families or groups of friends. A very comfortable holiday home, open plan living/kitchen, 3 spacious bedrooms. Two dining areas to choose, the covered outdoor dining area or enjoy the view from inside at the kitchen island dining area. Kick start your mornings with an espresso from the machine. Bring your boat there is plenty of parking and the boat ramp is less than 1.5 km from your accommodation. The warm clear Hokianga waters are abundant with fish just waiting to be hooked. If you don't fancy going out on the boat stay in, meander thru the garden cross the road and you will find yourself standing in the middle of one of the beautiful Hokianga beachs. The Hokianga has something for everyone. Situated just 3.5 hrs from Auckland city you will slip into Holiday mode as soon as you arrive. It's a different pace of life there. Visit Tane Mahuta- Lord of the Forest and largest living kauri in the world. The famous sand dune surfing is at your door with plenty of water taxis waiting at the Opononi jetty. Take one of the many fishing charters available. Visit Rawene or Waimamaku just 2 of the many historic Northland villages with cafes and art galleries to visit around every corner. The almost famous Opononi fish n chip shop is only a 2 minute drive. Enjoy a meal and drinks at the luxury Copthorne Hotel and Resort the kids can swim while you are enjoying the famous Northland hospitality. Pillows, duvet inners and duvet covers are included, you just need to pack your own sheets, pillow cases & towels. Electric blankets are fitted on all our beds to keep you snug in winter. Bring a couple of great books that you haven't had the time to read yet and enjoy laying back on the chaise lounge. Either way you won't want to leave but when you do, you will feel a whole heap better then when you arrived... that's the Hokianga promise! DUVET INNERS, DUVET COVERS & PILLOWS ARE INCLUDED GUESTS BRING OWN SHEETS, PILLOW CASES & TOWELS. TAKE YOUR SKY DECODER & CABLES. Duvet inners, clean duvet covers, feather pillows, tea towels, hand towels & bath mats are included in the rental. Comfortable home away from home. Loads of home comforts at the beach house. Quiet. Peaceful. Relaxing. Sun drenched. Extensive gardens. A modern but humble Bach. There’s a great ‘feel’ or ‘vibe’ to the property so you can slip into holiday mode with ease! The open plan living layout is perfect for holidays having a central area to all come together. The bedrooms are big enough to escape to if you need some peace & quiet. Plenty to do in northland. Beautiful golden beaches. The biggest kauri tree in the world the mighty Tane Mahuta is waiting to see you. The sunsets from the deck are stunning! Actually they are breath taking! A lovely peaceful property & area where it’s very easy to really relax! Beautiful 180 degree views of the famous golden sand dunes. Plenty of beach & water views being directly over the road from the beach. New Haier front loading 6.5 kg washing machine installed & bolted in so no wobbling. Plenty of parking for 4+ vehicles & a boat. As well as a turning area. Tv, DVD player, Bluetooth stereo, chaise lounge, 3 seater leather couch plus chairs. Eclectic furniture. A mix of old & new. Large fridge freezer big enough to keep most of the chilled items a family of 5 will need for a week. Breville or similar Espresso machine. Buy ground coffee. The basics are usually stocked in the pantry. Sugar, tea bags, instant coffee, some herbs & spices, salt & pepper, some cooking oil, flour, a few sauces. Bring your sky decoder & cables it’s all set up just plug it in. Freeview tv channels provided. Thanks so much for letting us stay at your Bach! We only spent a couple of days there but we will most definitely be returning. Excellent location for exploring. Shops eating places handy. Very clean tidy and well equipped house. 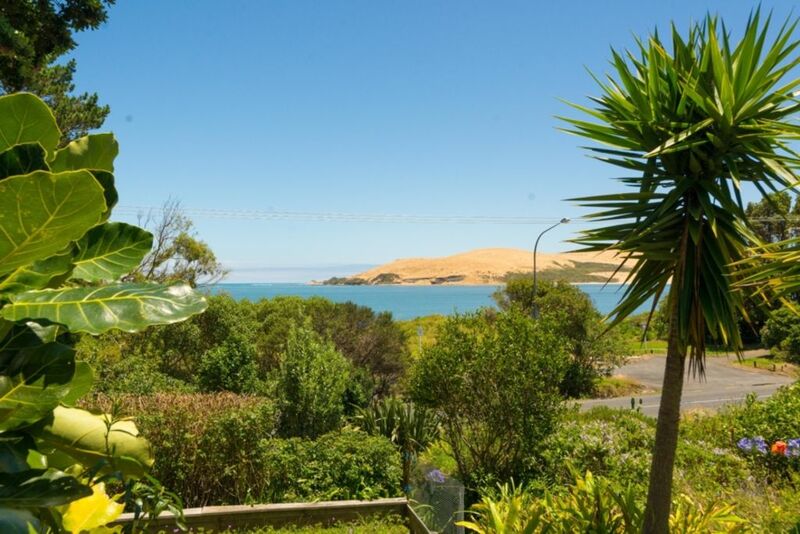 The Hokianga is a hidden paradise and this property maximizes the gorgeous views of the Harbour. We loved our stay at Claude’s bach in the Hokianga. The open plan kitchen living area with access to the deck with magical views is a treat, and easy access across the road for a swim makes it the perfect summer vacation spot. We took bikes and enjoyed biking down to Opononi for a change of scenery or walking to the Copthorne for an evening drink and more magical views. There’s also plenty to explore and a few nice cafes in the wider area to explore depending on what you’re into. A great kiwi bach experience in a beautiful quiet location. Beautiful home in an ideal location. Felt like a home away from home. Claude is a pleasure to deal with. The kitchen is well stocked with everything you need and more. The house has a lovely homely feel about it. I will be going back again and again. Would recommend staying here. Great views and a great bach. Visit Tane Mahuta Lord of the Forest. largest/oldest known kauri tree in the world. A very busy tourist attraction. You can only appreciate how remarkable he really is once standing before him. Surfing on the golden hokianga sand dunes. Another great activity to do, take the ferry to the other side of the harbour. Visit Waitangi, where the Treaty was signed in 1840 between the Maori Tribal leaders (indigenous people of NZ) & the British Empire. See some of NZ earliest history in Northland. Visit Bay of Islands, Kerikeri has great shopping & the BOI has unlimited sea adventures to do.